These rum-scented, fluted petits fours are a famous Bordeaux treat. 1. Bring the milk and butter to the boil together in a saucepan. 2. Stir the flour and sugar together in a bowl. Beat the egg and yolk together in a cup, then stir it into the flour mixture. 3. Next, add the hot milk mixture, whisking smooth. The batter should be thin and lump-free, like crêpe batter. 4. Stir in the vanilla and rum. Cover the batter and let it sit in the refrigerator for several hours or overnight. 5. Pour the batter into a mini bundt pan. 6. Heat the oven to 450°F/230°C. 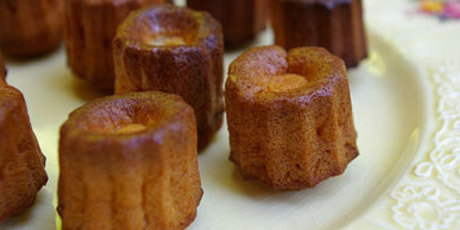 Bake the cannelés 15 minutes. Reduce the oven temperature to 350°F/180°C and continue baking until dark brown, 45 minutes to an hour. The cakes are meant to be quite dark on the outside. Unmould, and cool before serving.